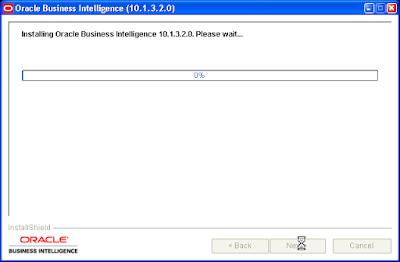 Oracle Business Intelligence Suite Enterprise Edition 10g Release 3 (version 10.1.3.2.0) is now available. This post looks at the install experience of this release. For those familiar with the previous versions of the product, known as Siebel Business Analytics (versions 7.8.x), the good news is that the install experience is by and large the same, in spirit, if not in exact look-and-feel. There have been some tweaks done here and there, there is no concept of an Oracle 'home', there is no Oracle Universal Installer (yet), and is fairly straightforward and painless to install, uninstall, and re-install (I must have gone through this process dozens of times, first with the development builds, then with each successive release candidate build that came out, and it all went through fine every time). 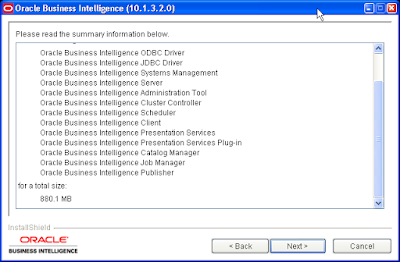 The folder structure is fairly straightforward - to install the BI Enterprise Edition Server products, including the BI Server, Presentation Services, and other products, you navigate to the "\Server\Oracle_Business_Intelligence" folder, and double-click the file named "Setup.exe". 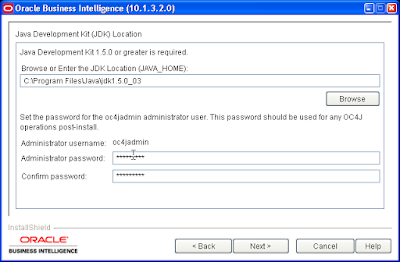 Before installing you need to make sure you have JDK 5 installed and available. 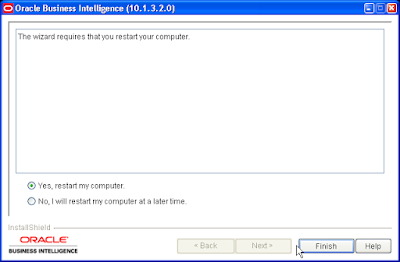 Also, if you intend using Microsoft Internet Information Server then you need to install IIS before you install BI EE. Basically you need to give the BI EE install guide a quick look. 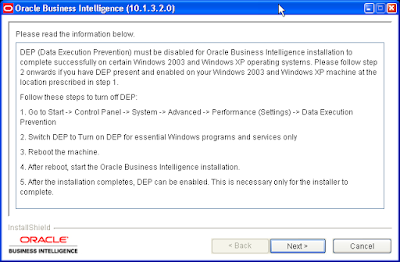 When the installer runs (on Windows XP and 2003 machines), you may need to temporarily disable DEP (Data Execution Prevention) in order for the installation to complete successfully. Instructions are given in the installer screen on how to do that. Since there is no Oracle Universal Installer, instead of specifying an 'Oracle Home' and a name for the Oracle Home, you specify a folder for the program files and another folder for the data files. 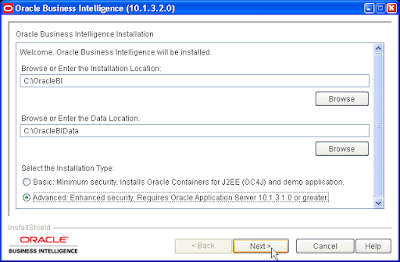 There are two install types you can select from - which specify the application server instance under which Oracle BI runs. If you choose IIS, then the appropriate ISAPI DLL is installed (will have a separate post on installing under IIS - which by the way is not that different). Mind you, even if you install under IIS, OC4J is still installed for the management components. 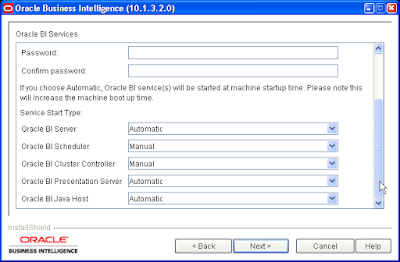 The three BI services that are configured to start automatically are "Oracle BI Server", "Oracle BI Presentation Services", and "Oracle BI Java Host" - you can change them to manual either in the install screen or after installation. 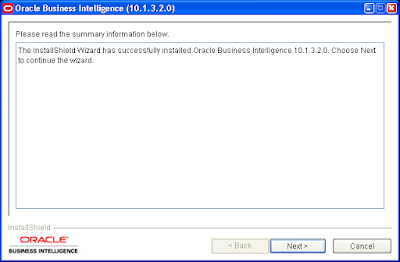 This step also should be very familiar to people who have installed Siebel Business Analytics. 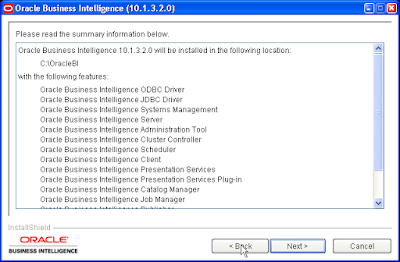 Since I selected the "Complete" option in the installer, the list of products installed is fairly complete - apart from the BI products like the Server and Presentation Services, the Administration Tool and BI Publisher (formerly XML Publisher) are also installed. The installer takes a few minutes to go through all that it needs to do to do the install. 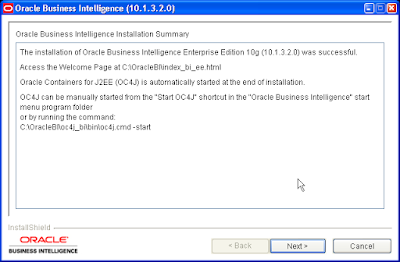 Once the installation completes, the post-install screen gives some information about how to access the "Welcome Page" and the OC4J instance installed. More on the post-install experience in the next post.